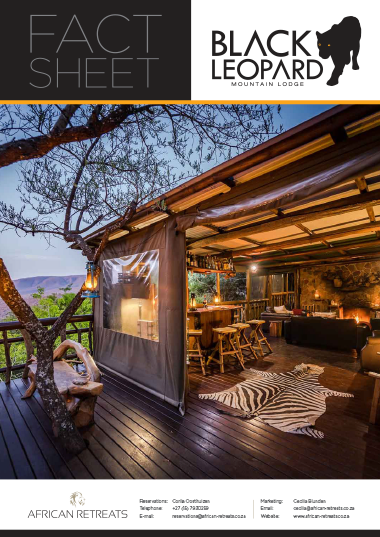 Nestled in Thabo Tholo’s mountainous and wild landscape lies Black Leopard Mountain Lodge. This unique, authentic and eco-friendly camp is set in a riverine valley and looks up to the sheer cliff face of the Lutla Mountain. 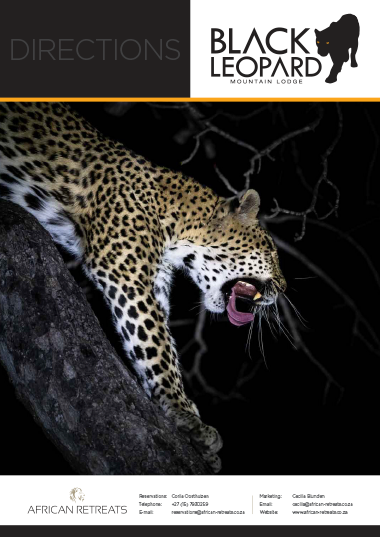 Black Leopard Mountain Lodge is located in the heart of the Thabo Tholo Wilderness Reserve. Explore this undulating and diverse landscape of this 6,000 hectare reserve on safari, on foot or even by mountain bike. There are many different bird and animal species to be found throughout this reserve, from the elusive leopard to the vibrant Narina Trogon, head out on safari in search of South Africa’s iconic species. Ancient archaeological sites are also found scattered throughout this landscape, rock engravings and old Voortrekker settlements mean this land has many stories to tell. 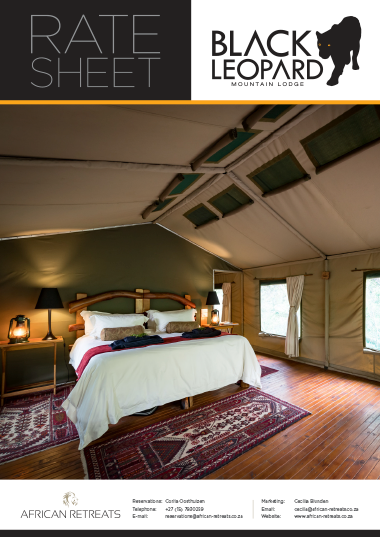 This wilderness retreat has multiple accommodation types to choose from, depending on your wanted safari experience. 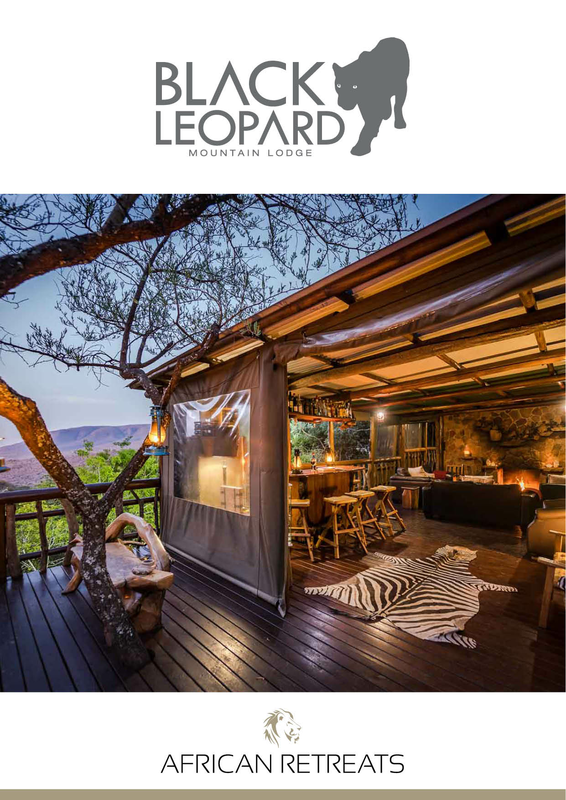 From the luxury canvas tents at Black Leopard Mountain Lodge, exclusive use of the 4-bedroom safari- style house Black Eagle View to Buffalo Thorn Camp, an authentic bush camp located in the heart of this reserve, each has something unique to offer. Black Leopard Mountain Lodge is easily accessible for self-driving guests. Located 3 hours from OR Tambo International airport and close to the iconic Panorama, and Greater Kruger routes. Due to the mountainous terrain of the Thaba Tholo Reserve, it is not possible to drive to any of our camps unless you have a low range 4x4 vehicle. Most guests are collected at our pick up point by our open game viewer which has a trailer for any luggage. The reserve entrance is situated just off the R37 Burgersfort & Polokwane road, outside Lydenburg/Mashishing, Mpumulanga. Please see 'Directions' at the bottom of the page for more details on how to get to the reserve.